An ancient site? - Gef! As a keen amateur antiquarian, James Irving had researched the history of Doarlish Cashen farm, going back to the early nineteenth century; all its occupants, save Pierre Baume (the mysterious ‘Old French Miser’), had been Manx farmers. 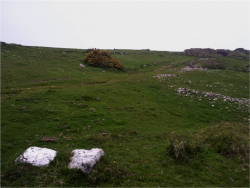 The other field-names are: Thalloo Noa, (‘New Land’); Lag y Loghan (‘Hollow of the Little Lake’); Slot Eairy (‘Shealing Cleft’) – which adjoins the Sound road, as does Phund Dan. Gill says that Phund is the equivalent of the English ‘Pound’ (as in dog pound), and Dan is sometimes used to denote a steep track. Fodor, during his February 1927 visit, took a photograph which he captioned Dan’s Pound, perhaps thinking that Dan was a former occupant or legendary creature! Then there is Cronk y Vate (Cronk means ‘hill’ and Vate is thought to be a loan word from the English ‘mate,’ either in its nautical use or simply as a friend, chum or pal). Lastly, there is Tur Veg, where Tur, like ‘tor,’ refers to something that stands up above the surrounding landscape, although since veg means ‘small,’ we should think of Tur Veg as denoting a small mound, a clump of bushes, or a heap of stones. Hinrichs argues that Doarlish Cashen, having been a two-story building rather than the more typical two-room cottage, indicates that its original occupants would have been persons of some importance, its height making it an ideal vantage point for a steward of the surrounding land. However, this is all speculation, as she freely admits. But it is certainly the case that other historical artefacts in the immediate vicinity suggest that the site was inhabited from a very early age. 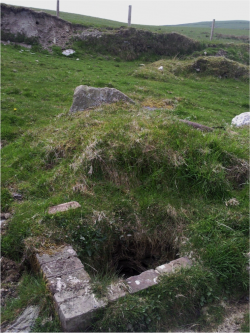 The well, which can still be seen just beside the ruins of the house, appears to be of ancient construction.